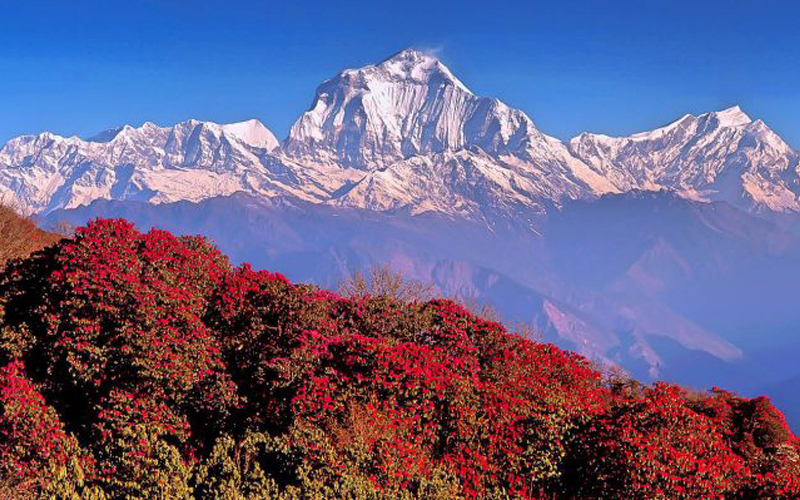 Nepal Trekking and travelling spring is a time of rejuvenation, and every year March brings spring along with it to the northern hemisphere. With the sun firmly past the equinox, it is time to say goodbye to the cold and dark of winter. The warmth of the sun not only brings trekkers to the highlands of Nepal, but also flowers, animals, and birds. And March, April, and may we promise of the good things to come am 99.9% sure they are lucky to travelling in Nepal. Weather is the most important factor in determining the good time for a trek, hiking and expeditions . And while March doesn’t graduate with flying colors on this front, it is still ahead of the curve. In March, the weather is generally clear and warm. And with every passing day, it just gets better. If you are making your way to Everest Base Camp hike in March, you will see very few trekkers on your way up. On your way down, however, you will perhaps see that the Everest Base Camp trek is indeed very popular. So basically you will have the trail to yourself and on your way up and will meet many people as adventurous as you are on your way down. Remember however that trekking in Nepal involves a wide variation of altitude and temperature and conditions can and will vary drastically with the altitude. A helpful rule of thumb is that the temperature goes down 1°C/1.8°F for a 100 m/ 300 ft climb. Also, remember that the mercury will take a nose dive if it gets cloudy. As the precipitation in March is not unheard of, it is extremely important that you have a good set of winter apparels. Other than that, stick to what you would do for any other month- layers. For more details see our guide on gear. One of the highlights of coming to Nepal in March is that you get to be part of Holi, one of the most colorful festivals of Nepal. Also, chances are you will get to see the ancient Newari festival of Ghode Jatra (Horse Festival) and the grand festival of Shivaratri in Kathmandu. The Sherpa’s joke that March is colder than January. That is because many Sherpa’s go to Kathmandu or other warmer places for the winter and only come back in March for the trekking season. While winter snow still hasn’t melted in many places, March is nevertheless a pleasant time to trek. The skies are generally clear and the temperature is tolerable if not amazing. About 12 percent of the 35,000 trekkers and mountaineers, who come to Everest annually, do so in March. So, it isn’t exactly crowded, but it isn’t empty either. With the snow lying around and chances of precipitation, a good solid boot is a must and so is warm clothing. Also, remember that Everest Base Camp Trek will take you to 5,644 m/18,519 ft at Kala Patthar and that is a good 800 m higher than Mont Blanc. So yes that warm clothing bit is not to be taken too lightly. As in all other places in the northern hemisphere, March sees a sudden flurry of activity in Everest. Rhododendrons are plentiful at around 2,500m and irises begin to show up. Many colorful birds including the restarts are on their way up to alpine shrubberies to breed. Basically, a new cycle of life begins in March. The Sherpa’s of the Everest Region are also preparing for a new agricultural cycle. Walls are repaired and compost is heaped and the ground is readied for planting. Everest in March is like a beauty that is yet to come of age- full of energy and full of promise. March in Annapurna Base Camp Trek usually sees about 10 percent of total trekkers. Since this trek starts low at about 1,000 m/3,300 ft, it is hot at the lower stretches while higher up there might be winter snow still lying around. So for a comfortable trek, a good boot along with light running shoes will be necessary. Also, remember that since Annapurna Base Camp is further west than Everest, westerly disturbances are more pronounced here. So, if you have say 8 days of good weather, there will be a 2 days of cloud and perhaps even rain/snow. Nothing to be worried about, but something to be prepared for. The rhododendrons are not yet in full bloom but are nevertheless a grand sight. You will also see first of the blooms of the beautiful tree orchids in March. You will generally see more flowers here in March as this trek passes through comparatively low and wet country. And the Annapurna Base Camp itself is great as ever. Given that winter snow is still lying around, the Base Camp will be an awesome sight at moonlight. If you can, try to coincide your base camp visit with a full moon, you can thank us later. However, with rising temperature and winter snow still around, March is also the beginning of the peak avalanche period in Annapurna Base Camp Trek. Remember avalanche gullies are like sirens- beautiful and dangerous. Do not hang around avalanche gullies and cross avalanche prone areas before 10 am. Reading up on the location of these gullies and hiring an experienced guide is highly recommended. At any time of the year, Annapurna Circuit offers the widest variety of landforms, vegetation and ethnic groups in Nepal. And in March this variety is accentuated. While Besishahar at 800 m/2,625 ft will be sweltering, Throng La at 5,416 m/17,800 ft will be covered in deep snow and will be miserably cold. Add to it the fact that a good portion of the trek passes through the trans-Himalayan region which experiences the full fury of westerly disturbances. That basically means that you could be dumped with a large quantity of snow. It is also very likely that trails will be closed off in certain areas is the snowfall is exceptionally high. While situations like these are rather rare, it will not hurt to be prepared for it. Think good boots, good glasses and some spare time. That perhaps has got to be the only bad thing about May in the Annapurna Circuit. Just like everywhere else, flowers are waking from their slumbers and birds are etching out territories for breeding in March. However in the drier trans-Himalayan region of this trek there will be very few flowers until May. Mountain views however will be generally sharp and temperature will be tolerable throughout except perhaps during the day you will do the pass and there is just about the right number of fellow trekkers along the trails. So while March is not the best of the times for Annapurna Circuit, it is definitely one of the good times.